Time and time again, customers who own an Edwin Jagger razor have told us how they love their razor’s perfect balance of beauty and function (a superior, close shave without razor burn). At the helm of this commitment to inspired design is Neil Jagger, founder and owner of Edwin Jagger. Jagger founded the company in 1988 after being unsatisfied as a consumer. Despite buying what were supposed to be high-quality Italian razors, he just wasn’t getting the shave he wanted. So he started creating his own in his house cellar, and his business grew from there. Edwin Jagger is now carried internationally, and its Sheffield craftsmanship is legendary. Each product is handmade by artisans who are meticulously apprentice-trained, so what you get is an ergonomic collector’s piece. And while the company is now a legitimate global brand, Jagger still designs each brush, razor, and stand himself. His passion for crafting beautiful wet shaving essentials runs deep and imbues every product. We recently had the pleasure of talking to Jagger about the nature of Sheffield craftsmanship, what influences him when he designs a piece, and the familial origin of the company’s name. Tell us how Edwin Jagger began. Edwin Jagger Limited was founded in October 1988, after I made my first handmade razor with a solid handle and a simple fixed head razor blade attachment designed to accept the Gillette GII blade. Having purchased an Italian-designed razor in the summer of 1988 and quickly finding it wasn’t as robust as I expected, I decided to design my own razor and manufacture it myself. My first prototypes were soon spotted and I had orders pretty much before I had set up a company. I started working in the cellar of my house, moving to a tiny workshop and then an office area of around 700 sq ft a year later. After a few years I moved to larger premises, where the company grew until such time I was confident enough to approach the bank to raise sufficient funds to purchase my first dedicated factory site in 1997, consisting of 7,000 sq ft of production workshops and warehousing space. I decided to name the company after my English grandfather, whom I never met. My middle names, Ernst and then Edwin (names of my German and English grandfathers, respectively) are on my passport. What does Sheffield craftsmanship entail? Just as with all cities whose reputation is steeped in the traditions of hand manufacturing, Sheffield represents some of the finest hand skilled manufacturing techniques still employed today. Sheffield craftsmen are often apprentice trained, requiring many years of precise, detailed, flawless standards of workmanship and finishing sometimes overlooked in other trades. Edwin Jagger hand-manufactured shaving accessories entail levels of skilled hand production and attention to detail that ensures our products are recognized as some of the finest available. We hear you design each piece in the Edwin Jagger line yourself. What inspires you when you’re creating a new product? Yes, I am involved in the design of every Edwin Jagger product. I am very much aware of the finest things in life, such as beautiful cars, boats, pens, watches, and lifestyle accessories designed by some of the most world-renowned designers. They have undoubtedly influenced me during many years of designing exactly what I would like to own and use myself every day. What are some of your business accomplishments? Firstly, setting up my own company to design and manufacture products I would like to own and then successfully selling them to the finest retailers in London. That was a huge step for me. Finding my products are also popular with wet shavers around the world was also a surprise as well as an accomplishment. Buying the buildings within which I grew my own factory reputation and product ranges, now found in more than 45 countries, is one of many accomplishments that can only be achieved from working with a wonderful management, administration and production team, all appointed by myself. What do you believe makes a quality product? Attention to the finest details coupled with careful consideration of the line and form as well as balance. What is one Edwin Jagger product every man should own and why? I think an Edwin Jagger DE Safety Razor (even if not used every day) is a great product to own. The quality of finish (craftsmanship), weight, balance, and ‘line and form’ make it a joy to use and a pleasing sight when left out on display in the bathroom. I have quite a few in my bathroom, all representing a wonderful combination of functionality with fine design. And they don’t require incredibly expensive blades. When you think you have a great idea, do loads of extra research before you ‘jump in’ and get started. And just as important watch the numbers carefully (do the math). Understanding how cost and the resulting selling price can dramatically influence opportunities for sales is so important. What can we expect from Edwin Jagger in the near future? More of the same in many ways. A steady stream of new products each year, new hardware items (razors and brushes) as well as software (shaving creams and soaps, etc.). We are also looking at new ways of promoting Edwin Jagger using the latest social media platforms and blogs. Detail, detail, and then even more attention to detail. The Great Barrier Reef as well all the tallest buildings in the world. Learn more about Edwin Jagger on their website. Follow Edwin Jagger on Instagram and Facebook. 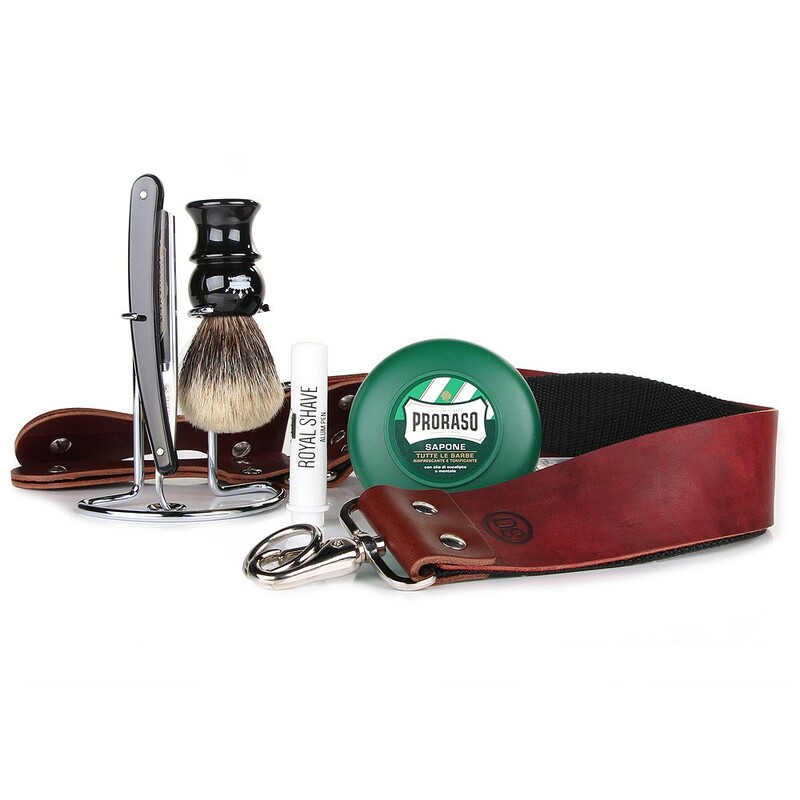 Shop Edwin Jagger products at RoyalShave. The History of Wet Shaving: D.R. Harris & Co.
A trip to fashionable St. James Street in London is incomplete without visiting D.R. 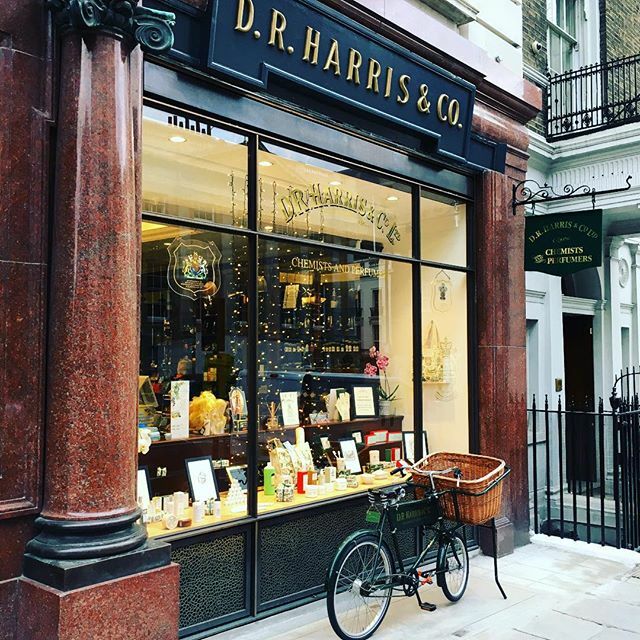 Harris & Co., one of London’s oldest pharmacies. Established just before 1790 at No. 11 St. James Street, the pharmacy was originally named Harris’s Apothecary, after owner Henry Harris. “D.R.” was tacked on after Harris’ cousin, Daniel Rotely Harris, joined the business. 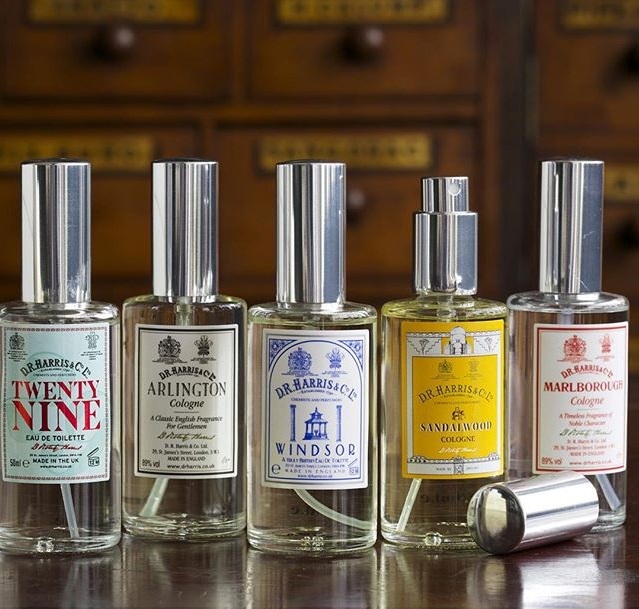 Henry Harris was a surgeon and Daniel Rotely Harris was an early pharmaceutical chemist, so they combined their skills to craft a luxury range of perfumes, lotions, and remedies befitting both the well-to-do gentry and the court. The pharmacy became well known for its Lavender Water, Classic Cologne, and English Flower perfumes. In 1938, D.R. Harris & Co. received the Royal Warrant as chemists to the Queen Mother until her death in 2002. Later that same year, the pharmacy was appointed as Chemists to His Royal Highness the Prince of Wales, and in 2012 received the Royal Warrant from Her Majesty the Queen. Today, in addition to being a fully-functioning pharmacy, D.R. Harris carries a large range of grooming products, including colognes, soaps, shaving creams, and their famous Skin Milk Aftershaves. You can pay D.R. Harris a visit at their historic St. James Street location, now slightly down the block from the original at 29 St. James Street, or check out their second location at 52 Piccadilly. Want more insight into the world of D.R. Harris? Check out our exclusive interview with the apothecary here. You can also find out more about D.R. Harris on their website, and shop D.R. Harris at Royalshave. We are in the full swing of the holidays here at RoyalShave! 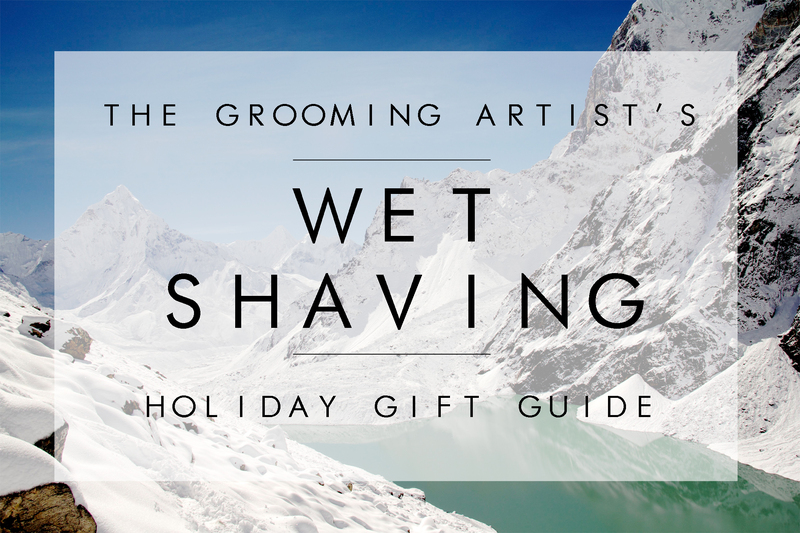 Since most of us are inundated with family gatherings and other social events this time of year, we’re saving you the extra stress of coming up with the perfect present for the wet shaver in your life with our Wet Shaving Holiday Gift Guide. From the straight razor novice to the gentleman looking to add a valuable new piece to his collection, we have a carefully selected pick that’ll fit the bill. Use this gift guide for finding that perfect present, or to fill your own Christmas wish list. This Dovo 5/8” Half Hollow Best Quality Straight Razor Shaving Set is a pleasurable way to introduce a young gentleman into the world of wet shaving. The 5/8”-wide, half hollow ground blade is suitable for beginners, while the shave brush, stand, shaving cream, and alum pen complete the wet shave experience. Your recipient will also learn the fine art of stropping with the included red latigo strop. Come Christmas, we all enjoy unwrapping a beautifully packaged gift. Save yourself the endless tangles of gift wrap and tape with the Feather Wood Handle Stainless Steel Safety Razor Set, which comes in a charming black box. 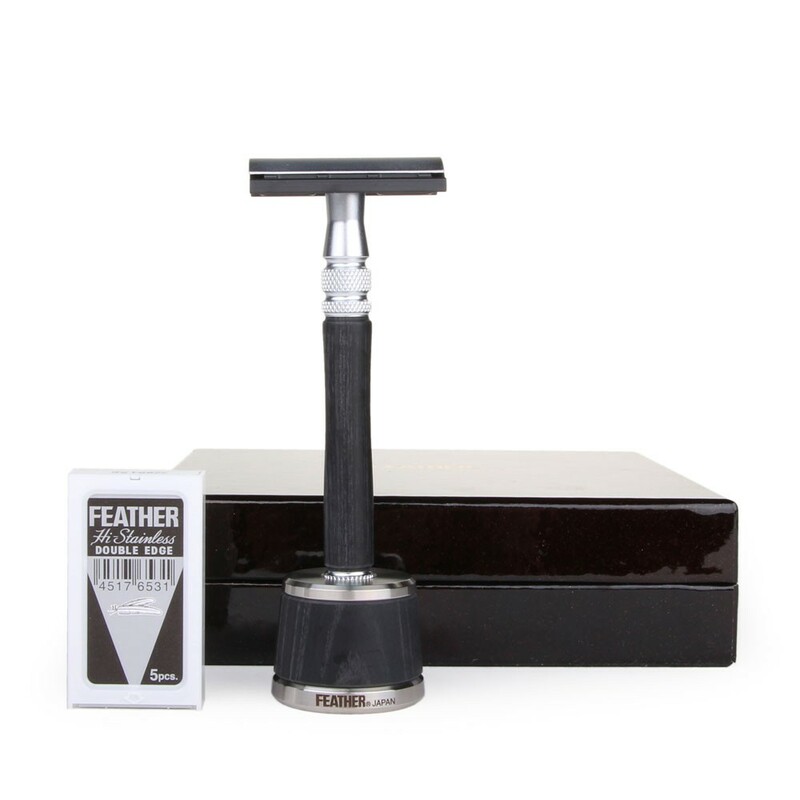 Feather doesn’t skimp on the details, either – the heavy, stainless steel razor is set in a wood handle for non-slip grip, and the set comes with a safety razor stand all dressed up in black. This way, the safety razor connoisseur in your life can proudly display his new collectible. When money’s not an issue, the Thiers Issard Silvertip Badger Shaving Brush is the definition of luxury. 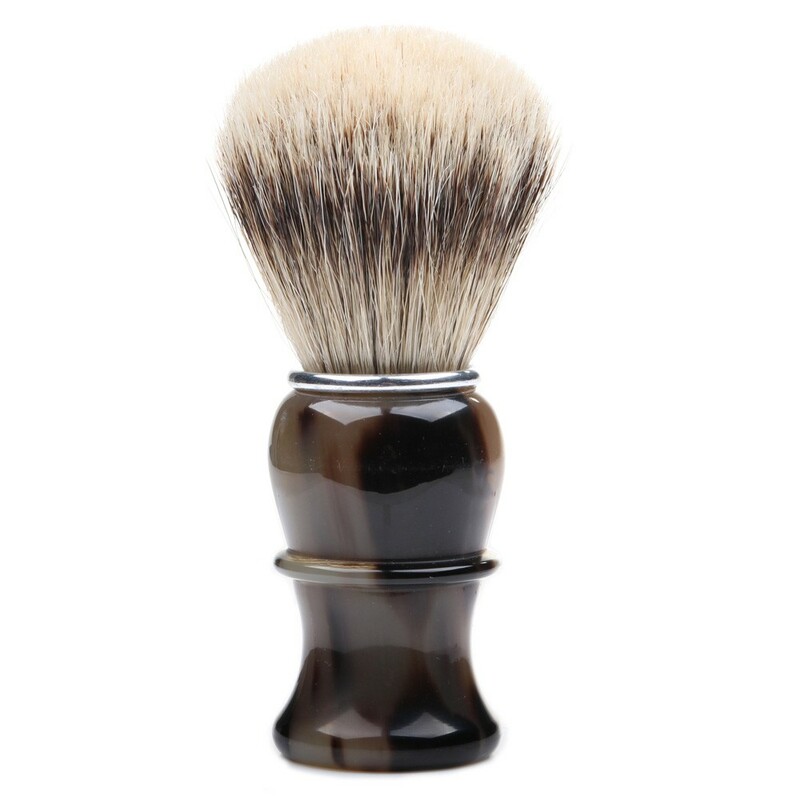 The thick 26 mm knot, in combination with the brush’s silvertip badger hair, is exceptionally good at holding water, producing rich lather quickly that lifts whiskers and prepares your recipient for a satisfying shave. For the dapper man who likes to smell good, old world barber Geo F Trumper excels just as much at fragrance as it does wet shaving implements. Geo F Trumper Cologne is available in bright and simple Extract of Limes, exotic namesake GFT, and warm, rich Sandalwood, a fragrance we highly recommend for cold weather. Whichever fragrance you choose, it is sure to please both the wearer and those who surround him. Irritation-free skin is a huge part of the wet shaving experience. Get him a shaving cream that’ll provide a smooth shave while conditioning skin so it’s in peak condition. Proraso’s Green Tea and Oatmeal Shaving Cream is designed to calm sensitive skin and is formulated without parabens, so it’ll check out in the book of even the most discerning skincare guru.